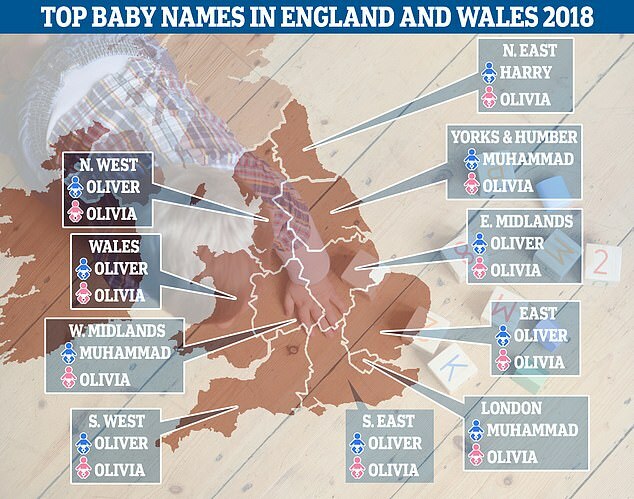 The most popular baby names in England and Wales were Oliver and Olivia for the second year running, the Office for National Statistics said. Olivia, Amelia, Isla, Ava and Emily were the top five names for girls in 2017 with Sarah falling out of the top 100 since records began in 1904. But Edith has returned to popularity after 84 years out in the cold, after formerly being popular at the turn of the 20th Century. Oliver, Harry, George, Noah and Jack were the most popular names for boys and in the capital Muhammad was the go to boy's name. Muhammad also topped the ranks in Yorkshire, the West Midlands and the Humber. Interestingly, there were three variations of Muhammad in the top 100. If combined, Muhammad, Muhammed and Mohamed would pip Oliver to the post as the overall most popular boys' name. The release of the latest official data on baby names is likely to raise the subject of the popularity of the name Muhammad once more. The latest data shows that Muhammad was the 12th most popular name given to baby boys in 2015. It also shows that Mohammed and Mohammad were in the top 100 as well – standing at 29 and 68 respectively, while Muhammed was just outside the top 100, at 121. In the past it has been reported that Muhammad is the most popular name for baby boys – however this is often because people have combined the various spellings of Muhammad. But combining spellings of one particular name distorts the list – for example combining Sophie, Sophia and Sofia on the 2015 girls list would knock Amelia off the top spot. The appearance of Mohammed in the top 100 is not such a new phenomenon – the first time this name entered the top 100 was in 1924 when it ranked as the 91st most popular name for baby boys. This was not a blip as the name has featured in the top 100 most popular names for baby boys every ten years from 1924 to 1994 and every year since 1996. Different spellings have joined it in the top 100 in more recent years, but three spellings of the name were also in the top 100 in 1954. The possible effect of popular sporting figures with the names Muhammad and Mohamed. Muhammad Ali and Mohamed (Mo) Farah may have played a role in increasing the popularity of the name. Harry, Oliver and Jack are showing no signs of slowing in popularity, with all three names having also been in the top five ten years ago. Nick Stripe, of the Office for National Statistics, said: 'Although Oliver and Olivia remained the most popular baby names in 2017, some fascinating changes took place beneath them. 'Leo entered the boys' top 10 for the first time, whilst Hunter rocketed into the top 100, also for the first time, reaching number 78. Thomas has been toppled in the top ten, falling out for the first time in 35 years. Those in the north east may have been inspired by the latest Royal to tie the not with Harry the most popular boy's name in the region in 2017. The top 10 boys' names are: Oliver, Harry, George, Noah, Jack, Jacob, Leo, Oscar, Charlie and Muhammad, with Leo entering the top 10 for the first time. The top 10 girls' names are: Olivia, Amelia, Isla, Ava, Emily, Isabella, Mia, Poppy, Ella and Lily. Parents are still making plans for Nigel, with 11 baby boys given the name in 2017. The name was thought to be almost extinct after fewer than three babies were named Nigel in 2016 but it has had somewhat of a resurgence. It is the first time Hunter has been in the top 100 names for boys. Ralph was a popular wartime name last in the top 100 way back in 1944. 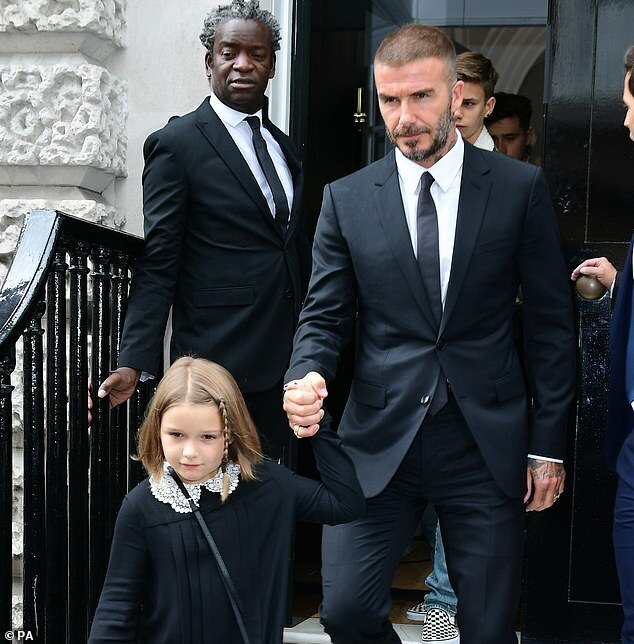 The name Harper has leaped 10 places in the girls' rankings, possibly owing its newfound popularity to David and Victoria Beckham's daughter. 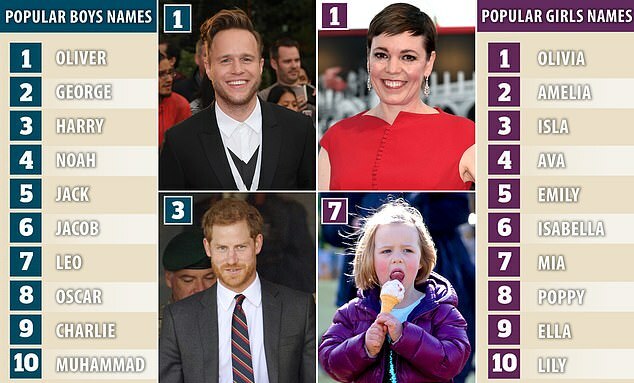 Despite Lily still placing in the top ten for girls, three fewer baby girls were given the name in the most recent stats, possibly owing to the antics of Lily Allen in the media. The singer recently published a book, 'My Thoughts Exactly even slamming her own father and admitting to having slept with female prostitutes following the breakdown of her marriage to Sam Cooper and said that she was feeling 'lost and lonely'. The name Luna for girls made an impressive leap, penetrating the top 100 for the first time with 30 babies given the name last year. Luna's rise may owe itself to Chrissy Teigen and John Legend giving their name to the child. The couple are extremely popular, with E! News saying that the 'power couple' are taking over Hollywood. Charlotte holds steady near the top of the list and sits in 12th place with 2,384 births in 2017 - the same position as 10 years ago. However, the name was dropping down the list before the birth of the Princess, reaching a low of 25th place in 2015 - before being propelled back up the rankings in the years since. As the Duke and Duchess of Cambridge's third child, Prince Louis, arrived in April 2018, will it have the same impact on naming trends? Louis was the 82nd most popular boys' name of 2017 with 819 babies born, a drop of 11 places on the previous year and down 22 positions on 10 years ago. Could it start climbing again in the years to come? However, the more popular British spelling of Megan also dropped down the list and barely made it into the top 100. The name dropped 17 places to become the 100th most popular girls' name of 2017. 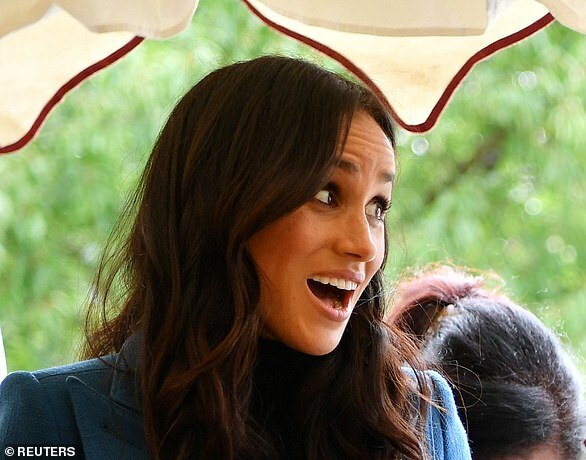 Elizabeth McLaren at the ONS said: 'The name Louis has been declining in popularity so it will be interesting to see if the naming of the latest Royal baby will reverse this trend next year. 'Meghan and Megan have also become less popular as baby names in recent times, but again, the addition of a new Royal with this name might reverse this trend. 'Royal names are often traditional names which do seem to go in cycles of popularity, although Elizabeth has consistently been in the top 100 since records began.' 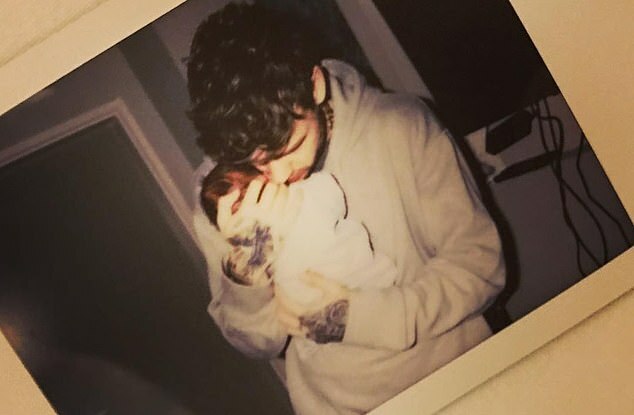 The ONS figures reveal that 85 babies born last year were called Bear, including Cheryl Cole and Liam Payne's son who was born in March. Liam said they chose the name because of the noises he made as a new-born. He told James Corden on The Late Late Show: 'When he was born, one of the midwives said it, he had this thing where if they don't have a good cry they get fluid in the lungs which is quite serious. 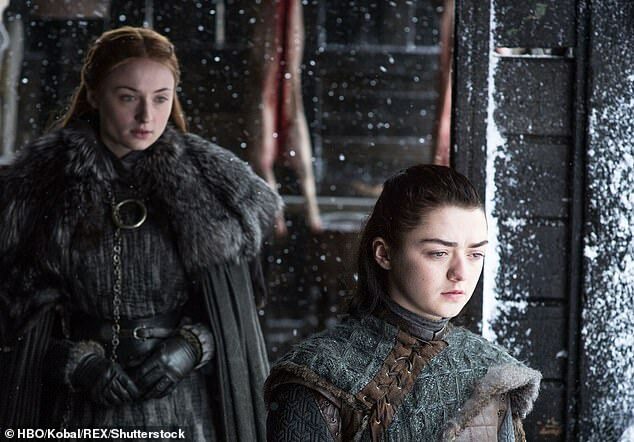 Smash hit fantasy series Game of Thrones may have had an effect on baby naming in 2017 with 343 babies were named Arya, in stark contrast to the 302 in 2016. Arya Stark is one of the main characters in the US show, shot across the UK and various locations in Europe. A similar name, Aria, is up by 20. The character is played by Maisie Williams, who may herself have influenced the rise in her name. Five more children than 2016 were given the name. Names like Bear and Luna could become more commonplace and may signal a real decline for traditional names like Sarah which doesn't even place in the top 100. Naming guru Sarah-Jayne Ljungstrom reckons parents are copying celebrities and Instagram stars who are picking 'dreamy' names for their youngsters. The top baby names for 2017 have seen a huge rise in cosmic monikers such as Luna, Aurora, and Hallie, and 'botanical' ones like Daisy, Ivy and Willow. Sarah-Jayne, naming expert at ChannelMum.com, puts this down to the 'Instagram effect'. She said: 'The Instagram effect is starting to shine through with dreamy space names for girls the stand-out new trend. 'Celeb favourite Luna is the second biggest climber in the Top 100 girls chart - up 30 places to number 48 - alongside other heavenly names including Aurora, which jumps 25 spots to become a new entry in the top 100. 'Meanwhile Hallie - a feminine nod to the famous comet - is up a whopping 46 spots and is the biggest climber. 'Dozens of celebs and influencers have picked heavenly names over the last year and it's a beautiful trend which will only blaze brighter as it gathers more pace on social media. For boys, there is a growing trend for 'soft macho' names such as Hunter, Leo and Ralph instead of short, sharp masculine names like Jake and Tyler. SJ added: 'These names work wonderfully as they appeal across the classes and regions, but without the grating sounds of older macho names. However, for girls it appears the Royals are losing their naming allure. Megan is down a whopping 17 places, Zara has dropped two places, Elizabeth slides six and Victoria is down by one. But Harry is holding up in second place alongside William who is a non-mover at number 11. SJ added: 'The fall of Megan may well reverse in next year's charts which tracks babies born this year.